Compost is recommended as a soil conditioner, soil enhancer and soil builder. Organic amendment, such as compost, will improve the physical, chemical and biological properties of your soil. Incorporating compost would increase the moisture holding capacity of our Florida sandy soils, thereby reducing drought damage to plants. When compost is added to heavily compacted soils, it will improved drainage and aeration, thereby reducing waterlogging damage to plants. Compost increases the ability of the soil to hold and release essential nutrients and promotes the activity of bacteria, fungi, protozoans, arthropods, mites, beneficial nematodes, earthworms and other important soil microorganisms beneficial to plant growth. Compost’s pH is near neutral. It has the ability to balance pH due to the fact that it is able to boost Cation Exchange Capacity (CEC). Soil pH affects whether nutrients present in the soil can actually be taken up by the plant roots. Nitrogen is most available at a neutral pH because the microbes that convert nitrogen into usable forms of ammonia and nitrate operate based at near neutral pH levels. Other nutrients are also affected by soil pH. Plants require seven micronutrients, elements essential to plant health but needed only in minute quantities. Five of these essential nutrients – Manganese, copper, iron, Zinc and Boron – become less available in alkaline (higher pH) soils. Molybdenum, on the other hand, becomes less available in acidic soils. CEC of a particular soil is the measurement of how well the soil retains nutrients and therefore how available its nutrients are to plants. A low CEC indicates that the soil has a low capacity for attaining nutrients, meaning that applied fertilizers quickly leach away. A hike CEC (over 50) indicates a greater capacity to retain nutrients, meaning that fertilizers can remain viable for long periods. Pure organic matter may have a CEC of 150. A loam soil will have a CEC ranging from 10 to 25, while humus has a CEC of 200. Many plant nutrients (potassium, calcium, magnesium and ammonium, a plant available form of nitrogen) exist in soils as cations, which are positively charged ions-molecules that have lost one or more of their negatively charged electrons leaving the molecule with a net positive charge. Plays and organic matter, especially humus, tend to accumulate extra electrons, forming negatively charged particles called anions. These large anions attract and hold cations, preventing them from washing away with irrigation or rainwater. No matter how much fertilizer you apply to a low CEC soil, you will achieve only a brief nutrient boost after which many of the nutrients will simply wash out of the soil leaving your plants deprived and your local waters polluted. Fertilizer in high CEC soil, however, will hang around longer, providing greater benefit to your plants. 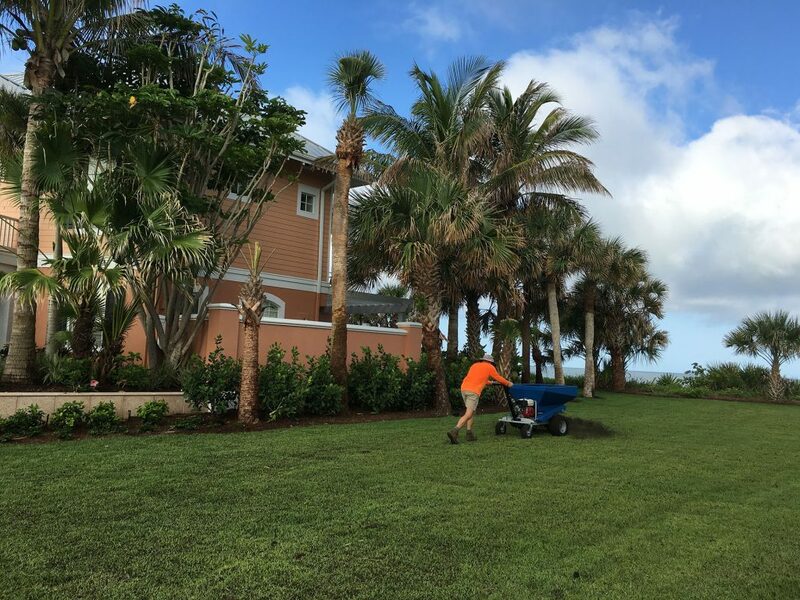 Soil Topdressing and composting will greatly improve the quality of the sandy soils so common in Sarasota and across Florida and create an environment conducive to better plant health care, and a better foundation for landscape design.